When I studied for my A-levels, I decided, in my questionable wisdom, to take Theatre Studies as one of my subjects. Well, I didn’t exactly end up making a career on stage, but I did enjoy it immensely and although Anton Chekov’s “The Seagull” left my entirely female A-level class (and you can only imagine the rampaging hormones that ran riot through that particular class) a little lost and bewildered (really, what was that stuffed seagull thing all about?) it didn’t stop me from writing a few things myself. Some of you may think that a theatre script won’t be as interesting to read as a novel, but I think scripts are just as much fun because you are using the ‘theatre of the mind’ to stage the performance… oh, alright, I just find scripts fun to read, and I hope you will enjoy reading this one too. You can purchase a copy of ‘To The Bride And Doom’ on Amazon in Kindle format and, of course, the traditional paperback format. When I studied for my A-levels, I decided, in my questionable wisdom, to take Theatre Studies as one of my subjects. Well, I didn’t exactly end up making a career on stage, but I did enjoy it immensely and although Anton Chekov’s “The Seagull” left my entirely female A-level class a little lost and bewildered (really, what was that stuffed seagull thing all about?) it didn’t stop me from writing a few things myself. 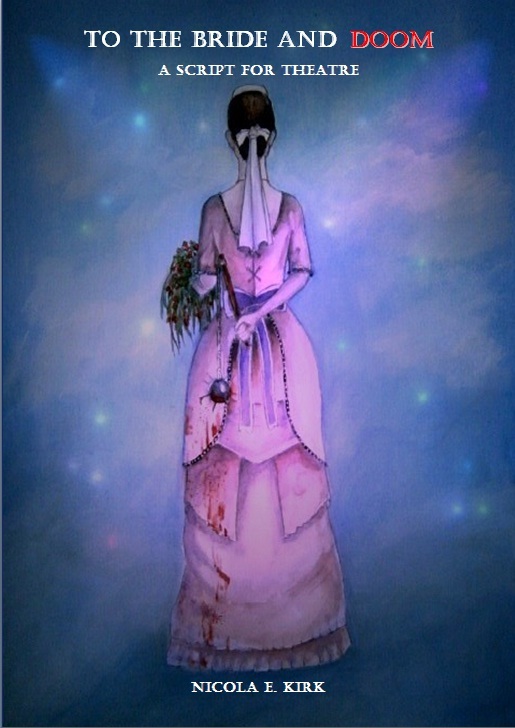 To The Bride and Doom is a Victorian black comedy in two Acts. Elizabeth Bennett is the daughter of a well-to-do family who find themselves a little down on their luck. Her parents believe the only way out of their financial predicament is to marry Elizabeth off to someone rich and stupid. This is something easier said than done, especially when Elizabeth comes up with some inventive, if not slightly psychopathic, ways of ditching the various spouses thrust upon her. If you are interested in obtaining a copy of the script or perhaps you are part of a theatre group and would like to arrange a performance of To The Bride And Doom, please email me at weirdworld@hotmail.co.uk.